This hotel is in a unique position on the exceptional volcanic ‘island of fire’, Fogo - a trip to this island during your holiday to Cape Verde is a must. The Prainha restaurant’s location is really great – eating breakfast on the terrace with sea views is truly memorable. It’s just a 10-minute taxi ride to get to your hotel from the airport. Set in a unique location, this comfortable hotel enjoys a stunning position on the headland in the upper part of the volcanic plains of São Filipe, not far from Chã das Caldeiras. The convenience of the hotel’s location is one of the major draws of a stay here, seeing you on the doorstep of the bars and eateries of São Filipe. 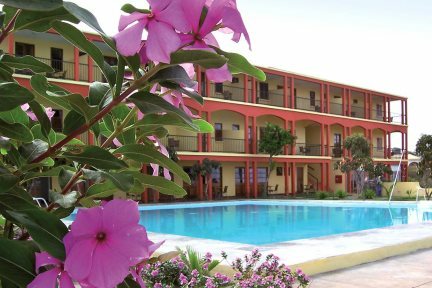 Xaguate has 39 well-furnished bedrooms, enjoying facilities such as air-conditioning and a television, while also coming equipped with a balcony or terrace. Guests will also enjoy a good range of facilities throughout the rest of the hotel. A panoramic terrace affords fantastic views, while a good-sized pool presents an inviting opportunity to cool off during the heat of the day. After a long day exploring the fascinating landscapes of Fogo, there’s nothing better than returning to your hotel for a tasty glass of the famous locally-produced wines made from vines that are grown in the warmth of the volcano's crater. Fogo is best experienced as part of a multi-centre island hopping holiday around the archipelago. We offer a number of itineraries that include a stay on Fogo. Visit our Island Hopping Holiday Ideas, or call one of our experts about a tailormade itinerary. Internal flights are provided by Binter. It should be noted that internal flights can and do change schedules and flights are sometimes cancelled, delayed or even early! Travelling time between Sal and Fogo is via Santiago and approximately 75 minutes' flying time. 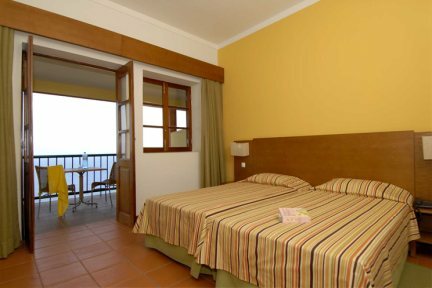 These double or twin bed rooms sleep up to 2 adults and have views to the rear of the hotel over the village, with balcony or terrace. Some rooms have a small fridge. 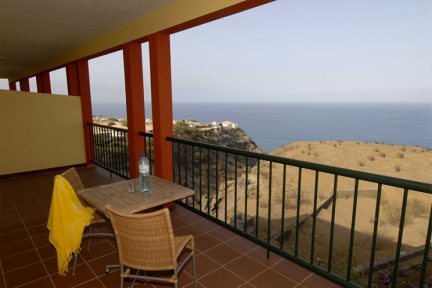 These double or twin bed rooms sleep up to 2 adults and have side sea views, with balcony or terrace. Some rooms have a small fridge. These double or twin bed rooms, with balcony or terrace sleep up to 2 adults + 1 child on an extra bed and have wonderful sea views. Some rooms have a small fridge. Fogo is the fourth largest island and is the only active volcano in Cape Verde. Thousands of years ago, Fogo erupted from the sea and at its peak, originally reached 35km but since then has lost 300m in height when a huge section collapsed. That said, it still boasts the highest peak in Cape Verde. Since 1785 many smaller eruptions have taken place over time and have all been inside the crater which have created craters in the floor of the original crater which now stretches a massive 7km wide and 10km long. The crater on Fogo is one of the highlights of Cape Verde and has created what is a very fertile land; coffee is grown on the outside slopes whilst the vines used to produce the famous Fogo wine are grown inside the crater. We highly recommend you try both. The scenery on Fogo is impressive: dark rocks and black sands give an impression of a lunar landscape. São Filipe, the capital of Fogo is a pretty town full of Portuguese squares, cobbled streets and sobrados, pastel houses decorated with quality woods and tiles from Portugal. The views from the promenade are of the island of Brava and a severe drop down to the black sands below. Visitors to Fogo tend to embark on a hike up the volcano with a rewarding lunch at the top in a restaurant offering magnificent views. The Islands provide some spectacular scenery and there are walks to suit all levels of fitness and experience. Some of the walks in the islands provide challenges which require previous hill walking experience, a higher than average level of fitness and proper walking footwear. For some walks guides are a necessity and can be arranged and paid for locally where as others are well signposted and there is no need for a guide. On Fogo, the most challenging is the ascent of the Pico in the crater, the top of which is 2829m. There are also many walks from the top of the crater down its sides.